that while the conflict itself may be over, bitter (and quite legitimate) resentments remain to complicate the peace process. The Sainnite invaders spent decades trying to subjugate Shaftal. Just because the war is now officially over doesn’t mean that Shaftali whose relatives were killed or who were themselves forced into servitude are in any particular hurry to forgive the Sainnites. Many of the Sainnites believe that their actions were justified. Even those Sainnites who think the Sainnites were in the wrong are not keen to be punished for their transgressions. While Karis, the current G’Deon (ruler of Shaftal), and Clement, current leader of the Sainnite refugee army, are sincere enough in their desire for peace, both of them face challenges to their leadership. One Shaftali leader remains convinced that Karis is a false G’Deon, while five of the thirteen Sainnite garrisons refuse to stand down from a wartime footing. With assassins stalking Karis and mutineers taking potshots at Clement, the fragile peace may be doomed in its infancy. If the delicate peace process wasn’t challenge enough, there are great powers in Shaftal, powers outside the formal structure headed by Karis. One of those powers has an ambitious scheme, a scheme that involves snatching Karis’ lover Zanja from her home with Karis and relocating her in time. Poor Zanja! She’s always being dragged away from her home, whether because that home has been obliterated on the orders of a seer who does not properly grok the concept of self-fulfilling prophecy, or because she has in a sense died for the greater good, or because there’s some meddling witch whose machinations require Zanja to be punted back down the timeline by a few centuries. The politics in this are of a familiar shape. While I would love to say that real history suggests a bright and shiny future for Shaftal, that would be a lie. Towards the end of the book, it is revealed that the Shaftali and Sainnites have more common ground than they once believed (details would be spoilers). I question whether that will actually matter, given that the long, bitter war is still fresh in memory. What are the elemental magics and how do they create elemental logic? The people in the land of Shaftal believe that the four elements determine a person’s personality, talents, and way of thinking. A fire blood is passionate, intuitive, and artistic. An earth blood is practical, instinctual, and obstinate. A water blood is humorous, unpredictable, and organized. An air blood is logical, principled, and manipulative. There’s textual evidence that this isn’t just some mystical delusion like astrology or the MMPI but actual fact (at least in the world of the novel). Bad enough to be puppets but the Shaftali get to see their strings. I cannot stress enough how creepy I find that; it’s as bad as being trapped in a Greg Egan story. Happily, it’s clear from the text that despite being shaped by mystical forces outside their control, the people of the region, with one significant exception, still have free will. Marks isn’t needlessly cruel to her readers; her books are not exercises in grimdark nihilism. Yes, the books describe terrible events, but it is clear that everything in this series has a purpose and that, as difficult as the path may be, the characters are struggling towards a worthy destination. I just wish we would get there already. While this novel can function as a stand-alone, it also advances the grand story arc. Long-time readers should be pleased with this installment, save for the pesky detail I mentioned at the beginning: the conclusion is yet to come and nobody has set a date for its release. 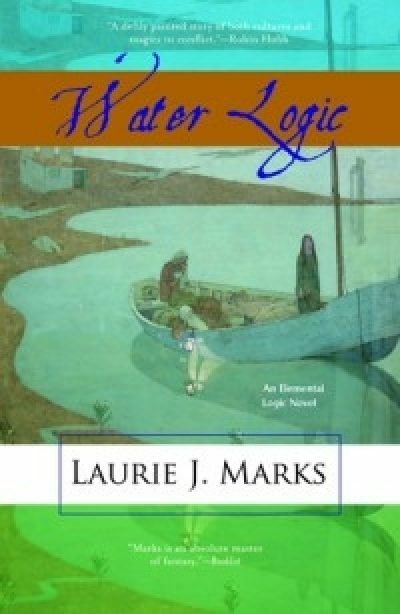 Water Logic can be purchased from the same place you bought the first two books.